The vibrant green of Turkey’s lush, humid Black Sea Coast surprises those who imagine the country to be nothing but barren steppe. From the European border with Bulgaria to the Georgian border, dense pine forests cover the mountaintops while lush vegetation and bountiful crops grow in the lower elevations and valleys. Along the coastline, mile after mile of beautiful uncrowded beaches offer sun, swimming and relaxation. In the springtime, delicate wild-flower blossoms carpet the rolling meadows of the eastern hills. The wooden houses in fishing villages and mountain hamlets alike preserve indigenous and traditional architectural styles. The humid climate and fertile soil encourage cultivation of a variety of crops including tea, tobacco, corn and hazelnuts. The magic of such a diverse landscape proves irresistible to any friend of nature, whether hiker or mountain climber or canoe enthusiast; whether you go in by mountain bike or by jeep safari. Archaeological excavations from the early Bronze Age settlements at Ikiztepe in Samsun Province have uncovered evidence of the region’s earliest inhabitants. The Hittites, Miletians, Phrygians and, according to Homer, the Amazons all colonised parts of the coast. Alexander the Great in his world conquest also brought the region under his sovereignty. Eventually, it was incorporated into the Roman and then the Byzantine Empire. The 15th century saw the greater part of the area come under the Ottoman rue of Sultan Mehmet II. The Black Sea is easily accessible to tourists and provides a wide range of hotels and restaurants at a variety of prices. The Yildiz (Istranca) Mountains bisect the province of Kirklareli. Lush mountainous landscape dotted with quaint houses transport you to an idyllic and tranquil reverie. In the city of Kirklareli the oldest mosque is the Hizirbey Mosque, built in 1383. The mosque complex includes a bazaar. Nearby stands a hamam (bath) also built under the patronage of Hizir Bey. The 14th-century Kirklar Memorial with its impressive 18 columns stands on Kirklar Hill honouring the site where 40 soldiers lost their lives when the Ottomans conquered this area under the command of Murat I. The Archaeology Museum exhibits finds from local excavations. The Sokollu Mosque in Lüleburgaz, on the Edirne-Istanbul road, is an exquisite work of Sinan that dates from 1570. The neighbouring town of Babaeski also boasts a Sinan building in the Cedid Ali Pasa Mosque. Vize (Byzia), an important Byzantine center, houses the Küçük Ayasofya church and a castle, both dating from the Byzantine period. If you are travelling north to Bulgaria, linger for a few hours in the peaceful and green town of Dereköy, the last stop before the border. Kirklareli’s Black Sea Coast is another place to enjoy beaches and good fish restaurants. Igneada, 98 km east of Kirklareli, lies sandwiched between sandy shores and the Yildiz Mountains. Kiyiköy (Midye) is another holiday resort town with good accommodation and picturesque dwellings from the Middle Ages. The town and its walls date from the Byzantine period. The best site to visit in Midye is the historic St. Nicholas Rock Monastery. Across the Bosphorus, on the Asian shore, Sile’s (71 km from Istanbul) long sandy beaches, overlooked by the remains of a Genoese Castle, attract many visitors. The excellent restaurants and nightlife make it a popular weekend retreat for Istanbul residents. Cotton blouses and shirts (Sile Bezi) are sewn and embroidered here. Originally founded by a Polish prince as a home for Polish exiles, Polonezköy (25 km from Istanbul) has been transformed into a relaxing resort with guest houses and restaurants serving a delicious selection of fresh local produce. Inland from the coast, the rolling hills and peaceful woods make an excellent area for horseback riding. 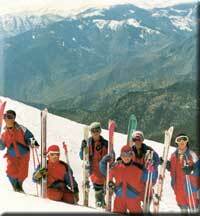 In the Köroglu Mountains is Kartalkaya, one of Turkey’s major ski resorts. In the summer you can stop for a picnic at Gölcük Lake. The breathtakingly beautiful Yedi Göller (Seven Lakes) National Park lies north of Bolu. Nearby, the town of Mengen has a reputation for its good cooks and holds the annual Chefs’ Festival of in August, featuring traditional Turkish specialities. The sites around Konuralp (53 km from Bolu) the ancient Prusa ad Hypium, continue to yield artifacts from both the Roman and Byzantine periods, which are on display in the local museum. Among the ruins, the Roman theatre is not to be missed. Back on the coast, the lovely beach and comfortable guest houses and hotels at Akçakoca ensure that it remains a popular holiday resort. Near the town, you can explore the remains of a Genoese castle now set amid hazelnut groves. Eregli, whose ancient name was Heraklea ad Pontus, stands on a hill adjacent to a Byzantine castle. In the spring the aroma of strawberries, some of the sweetest grown in Turkey, fills the air, making a visit a mouthwatering experience. Eregli derives its name from the mythological demi-god, Hercules, who, in the 11th century caught the three-headed dog, Cerberus, guardian of the gates of hell. According to Xenophon, Cerberus resided in the cave Cehennemagzi (Entrance to Hell), outside of Eregli near Kavakderesi. Zonguldak is a major center of coal production and an important Black Sea port. The scenic road on the east side of town leads to the areas of Kopuz and Uzunkum, where tea gardens and restaurants beckon tourists to spend a leisurely afternoon. Connoisseurs of fine handcrafted wood, travel to Devrek, a pretty town, 50 km southeast of Zonguldak, to purchase its renowned wooden canes. Karabük, situated 10 km southeast of Safranbolu is the most important industrial center in Turkey, known for its iron and steel industry. Not far from Karabük lies the charming park of Çamlik, the perfect place for rest and relaxation. The entire area is dotted with pine forests and there is a lovely tea garden and restaurant in a nice place to enjoy nature. Also inland and further to the east is charming Safranbolu. Step back in time in the lovely “old world” style of the town to see some of the most beautiful traditional old houses, unique in Turkey for their outstanding design and construction. The most interesting of these include: Kaymakamlar House, Aygiroglu House, and Asmazlar Havuzlu Konak which has been restored and is now used as a hotel operated by the Turkish Touring Automobile Club. The Mektepçiler House is also noteworthy as is the Haci Memisler House. Pasa House is also restored and has been converted into a lovely cafe and pension as well. The castle on the hill offers a vista of the town. Be sure to see the Cinci Inn and Hamam (17th-century Turkish bath), the Izzet Mehmet Pasa Mosque and Library (18th-century), and the Köprülü Mosque which also dates from the 17th century. Also worth seeing are the Dagdelen Mosque (18th-century) and Kaçak Mosque (19th-century). UNESCO has named Safranbolu as an international cultural area. Safranbolu originally takes its name from the saffron fields that dotted the area in the 19th century. Today, saffron fields abound in the village of Davutobasi, 20 km away, where a thriving saffron business continues. Before leaving, be sure not to miss the Arasta (Old Bazaar) where you can watch craftsmen at work and bargain with them for their goods. The “lokum” (Turkish Delight) is also a special treat, unique among lokum connoisseurs and a must to sample. About 36 km. south of Karabük is Eskipazar, where the old Ömer Beyler Mansion is located. It is now restored and famous for its ornately decorated ceilings. Amasra (17 km from Bartin), one of the most beautiful towns on the Black Sea coast, was called Sesamos in ancient times, when it was founded by the Miletians in the sixth century B.C. It stands on a peninsula made by two inlets. The eastern side enjoys a reputation for good swimming. On a rocky promontory rise the ramparts of a Byzantine citadel, inside of which is an old church, now the Fatih Mosque. The necropolis dates from the Roman period. Remnants from Amasra’s entire history are displayed in the Archaeology Museum. You can purchase a lovely handcarved wooden souvenir on Çekiciler street. Continuing eastward along the coast, you arrive at Çakraz (15 km east of Amasra) a typical fishing village with excellent beaches, friendly accommodation and fine restaurants. The winding road between Çakraz and Inebolu has steep mountainsides and offers a spectacular panoramic view. Beyond Çakraz is Kurucasile, a town known for its fishing boat manufacturing. Cide, 28 km farther, has good hotels and a pleasant beach, providing comfort and relaxation. Gideros Bay will make you think a dream has come true. Inebolu ( 100 km east of Cide) is a typical Black Sea town set in lush greenery displaying many fine examples of traditional Turkish architecture. East of Inebolu is Abana, another good holiday center. Situated inland amid beautiful forests, the provincial center of Kastamonu (90 km south of Inebolu) also dasts several important monuments: the 12th-century Byzantine castle, the 13th-century Atabey Mosque and the Ibni Neccar Mosque of 1356. The Archaeology and Ethnography Museum displays artifacts found in the region and the Liva Pasa Mansion Museum also has local ethnographical artifacts. 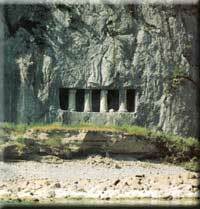 Near the town is Evkaya, a rock tomb dating from the sixth century B.C. In the village of Kasaba, the 14th century Mahmut Bey Mosque retains some of the finest wood carvings found anywhere in Turkey. About 41 km west of Kastamonu via Daday, Çömlekçiler village has traditional timber houses and farms offering country horseback riding tours. 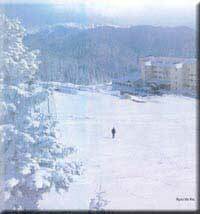 Then, 63 km south of Kastamonu is Ilgaz National Park, a delightful protected area in the Ilgaz Mountains, in which also is a ski center and good accommodation. East of the park by the Devrez and Kizilirmak rivers, is Tosya where extensive rice fields cover the landscape. Ilgarini Cave, in the region of Pinarbasi (northwest of Kastamonu), is one of the largest caves in Turkey. It is a wonderful place for trekking and exploration off the beaten path. Sinop (192 km northeast of Kastamonu) is one on the most beautiful natural harbours of the Black Sea. It was founded in the seventh century by Miletian colonists and was the birthplace of the third-century philosopher, Diogenes the Cynic. The town’s citadel and the foundations of a temple dedicated to Serapis date from that period. The Archaeology Museum exhibits several beautiful golden icons and the 18th-century Aslan Torunlar Mansion Museum displays ethnographical artifacts. Other important monuments include the 13th-century Alaeddin Mosque and the Alaiye Medrese. Excellent fish restaurants along the charming fisherman’s wharf serve tasty meals while brightly coloured boats bobbing in the water complete the picturesque setting. Sinop is also known for its traditional nautical wooden carvings. Seaside hotels and holiday villages provide accommodation in all price ranges. Some 35 km to the southwest, high in the mountains, lie the yaylas (mountain plateaus) of Güzfindik and Bozarmut. At an elevation of 1,350 meters, these green pastures with their summer residents offer a glimpse into a traditional way of life. Gerze is situated on a peninsula 40 km east along the coast and is surrounded by parks and beaches. Farther along the coastal road, you arrive at Yakakent, a fishing village with clean, sandy beaches. Çamgölü, a large forest which slopes to the sea, has camping sites, guest facilities and restaurants. Samsun (418 km northeast of Ankara) is a modern industrial city that has served as a major port for centuries. Products from all over the region are exported from this city, which annually hosts the Samsun Trade and Industrial Fair. Samsun found itself at the center of the Turkish War of Independence on May 19,1919, when Atatürk landed here to organise the defence of Anatolia. The Atatürk Museum houses many objects and documents relating to the war. An equestrian statue honouring the founder of the Republic stands in a prominent place in the city park. The 14th-century Pazar Mosque and the 19th-century Büyük Mosque reflect two different Turkish architectural styles and are interesting to compare. The Archaeology Museum not only displays the fends from Ikiztepe but also artifacts from Dündartepe and Amisos, as Samsun was known in ancient times. The charming little port of Ünye (93 km east of Samsun) is one of the nicest holiday towns on the eastern Black Sea and justly boasts of its excellent beaches and camping facilities. Do not miss the extraordinary 18th century town hall. Within easy reach of Ünye is the beautiful Çamlik Beach. After Fatsa (22 km east of Ünye), another holiday town on the road to Ordu, the ruins of the Byzantine Jason Church, now a museum, stand on the Çamburnu promontory. Legend has it that the Argonauts landed here on their quest for the Golden Fleece. Fish restaurants serving the finest tea found in the region dot the 50 km of scenic road to Ordu. Sea snails, a regional speciality, are particularly delicious at Yaliköy. Returning from the Babylonian campaign, the survivors of “Xenophon’s Ten Thousand” left Anatolia from Ordu in their retreat to Greece. Today, it is a beautiful port situated at the foot of a forested hill. In the Pasaoglu Konak (mansion), now the Ethnographical Museum, see how a rich and influential 19th century family lived. Hazelnut production centres around Ordu and every September the town hosts the Golden Hazelnut Festival. Be sure to sample the delicious chocolate nut candy. It is worth spending some time at an 18th-century church, 2 km of town, and the pretty beach of Güzelyali is worth visiting. 58 km further south, at an altitude of 1,250 meters, lies the yayla (plateau) of Çambasi offering beautiful mountain views. The yayla of Keyfalan, at 2,000 meters, is another popular summer destination for local residents. The ruins of a Byzantine fortress offer a wonderful panorama of Giresun. It was from this city, ancient Cerasos, that the Roman general Lucullus exported the first cherry trees to Europe. An 18th century church (now a museum) makes a short visit worthwhile. 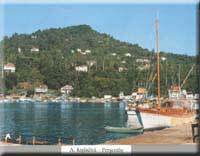 Outside of town, Giresun Adasi (Giresun Island) is said to have once belonged to the Amazons. A ruined temple supports this theory. The Aksu Art and Culture Festival is a yearly event in May. To get off the beaten track, take an excursion to the high mountain yaylas of Bektas or Kümbet. Between Giresun and Trabzon, are the quaint coastal towns of Kesap, Tirebolu, Görele, Vakfikebir and Akçaabat squeezed between wooded mountains and the Black Sea waters. Stop at Görele for delicious, submarine-shaped meat and cheese ‘pitas’, at Vakfikebir for the best butter and at Akçaabat to sample the best köfte (meat rolls). Trabzon, the major city of the region, was founded in the 7th century B.C. by Miletian colonists, and was later at the center of the Comnene Empire established after the fall of Byzantine Istanbul. The exiled Byzantine court ruled until 1461 when the Ottomans conquered the area. The jewel of Trabzon’s monuments is the restored 13th-century Byzantine church, used for centuries as a mosque and now as the Ayasofya Museum. Splendid frescoes, some of the finest examples of Byzantine painting, cover every one of the interior church walls. Several other churches were converted to mosques, two becoming the Fatih Mosque and the Yeni Cuma Mosque. The Ottoman Gülbahar Mosque, a typical provincial style building, is set in a lovely tea garden. Wooden houses fill the old quarter nestled in the ancient fortifications, which still retain the spirit of a medieval town. The house in which Atatürk stayed has been made into a museum. On the hills above Trabzon, Boztepe Park offers a beautiful view of the city and coastline. On the western slopes of Boztepe Hill stands the Irene Tower, built by Empress Irene of Trabzon in 1340. Just east of the city, the village of Sürmene has an impressive 19th-century mansion known as the Kastel. Near Trabzon, south of Akçaabat, the lovely highland meadows of Karadag, Hidirnebi and Erikbeli are ideal for hiking and picnics. The road inland from Trabzon winds through spectacular mountain landscape before reaching the Zigana Tunnel, the longest in Turkey. Nearby Hamsiköy is a charming mountain village, that has gained a national reputation for its excellent cuisine (including the best rice pudding), and is also conveniently near the Zigana Ski Center. The beautiful meadows and highland pastures of Gürgenagaç Yaylasi, Kirazli Yaylasi and Solma Yaylasi are ideal sites for outdoor activities. The traditional Kadirga Festival celebrates the annual summer migration to the high mountain pastures. Altindere National Park provides a magnificent setting for the 14th century Sümela Monastery, perched high on a cliff face 270 meters above a deep gorge. Surrounded by the ruins of the monks’ quarters, is a church covered inside and out with brilliant frescoes. Southeast of Trabzon is lake Uzungöl, a lovely alpine lake surrounded by mountains and meadows, excellent for camping, hiking and fishing. The restaurants there also make it the best place for eating river trout. Gümüshane (88 km east of Trabzon), on the ancient trade route between Trabzon and Iran was once of considerable importance. Many elegant buildings still remain. 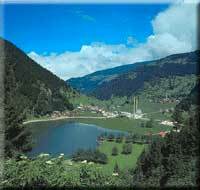 Set amid fruit groves and wild roses, the town is a natural stopping point between Trabzon and Erzurum. Take the opportunity to try the local rosehip syrup and marmalade. Bayburt (77 km from Gümüshane), is situated on the banks of the Çoruh River and lies on what was once known as the Silk Road. Marco Polo and the inveterate Turkish traveller Evliya Çelebi both passed through this city. The remains of a Byzantine castle, as well as major mosques, Turkish baths and fascinating carved tombstones are among the significant sites. Two of the most important monuments in Bayburt are Ulu Mosque (18th century) and the Clock Tower in the city center which dates from the republican period. Also worth seeing are the twin mauseoleums of Sehit Osman and his sister which are situated on the hillsides at the southern entrance to the city. Osman Park on the Çoruh River has wonderful scenery and is a lovely place to relax. Rize (75 km east of Trabzon) is built on a mountain slope covered with tea bushes that look like puffy green pillows. Be sure to see this typical Black Sea city’s 16th-century Islam Pasa Mosque and the remains of a Genoese castle. From Ziraat Park you can take in a splendid panorama of the whole area. A lightweight summer cloth of good quality and printed with colorful patterns comes from the Rize area. During the Summer Tea Festival you can purchase the best blend of Black Sea tea. Mehmet Mataraci Mansion is now an Atatürk Museum that displays his personal belongings as well as ethnographical artifacts from the region. Turning inland after Ardesen off the road going east from Rize, you come to the beautiful little town of Çamlihemsin straddling a rushing stream. Nearby is the Firtina Vadisi (Valley of Storms) – ideal for canoeing, and the beautiful Zir Castle, and stone bridges from Byzantine times. After walking around Ayder’s rolling meadows, you can relax in one of the many hot springs. For those who like mountain climbing, this is the best starting point for scaling theKaçkar Mountains. This emerald range is one of the best and the most challenging for climbers in Turkey. The whole of the Kaçkar Range constitutes the beautiful Kaçkar Daglari National Park. In the mountains south of Rize, Anzer village offers the world-famous and nutritious Anzer honey and is a nice area for hiking and for its botany. Ikizdere Canyon, between Anzer and Ikizdere Plateaus, is a great spot for hang-gliding. At the same time you get a bird’s-eye view of the area. Near Rize, the towns of Çayeli, Pazar, Ardesen, Of and Findikli all enjoy a subtropical climate, lush green settings and boast traditional chalets. The Çamburnu coast is covered with golden pine trees where many species of migrating birds stop and it is a lovely area for resting and picture taking. Hopa, an attractive town at the foot of a forested mountain, is the last port before the Turkish-Georgian border. The international boundary actually divides the village of Sarp. 27 km northeast of the town of Borçka on the way to Artvin there is the wonderful alpine lake of Karagöl, with various pine trees, as well as other flora and fauna. The road to Artvin traverses the Cankurtaran mountain pass, where verdant landscape changes to barren rocks. Hatilla Valley National Park, about 25 km in length, is 10 km from Artvin, between the confluence of the Çoruh River and the Hatilla stream in the east, and Mt. Nathali (2,923 m) in the west. Canyons with sheer cliffs and vertical drops can be seen throughout the park. Both Mediterranean and Black Sea flora flourish together in the park along with bears, deer, wolves, foxes and eagles. Special houses on top of wooden stilts are home to the park bees who produce the famous regional honey. A winding drive midway up a mountainside takes you to Artvin, the capital of the province. At the foot of the escarpment, a ruined 16th-century castle crowns a rocky outcrop. Artvin is a charming city with beautiful old Turkish houses, typical of the region. The area’s mild climate makes summer visits delightfully refreshing and every June, crowds of tourists, as well as brightly-clad locals, throng to the Kafkasör festival, where the spectacle of fighting bulls highlights the celebration. The adventurous might like to attempt white-water rafting on the wild, romantic Çoruh river. During the Middle Ages the Artvin area came under Georgian sovereignty, which makes it the best place for touring remains of the Georgian past. Its wonderfully scenic roads lead to the ruined churches and settlements that stand as a legacy of this period. The best-preserved of these are at Barhal and Ishan, in the majestic Kaçkar Mountains. Barhal also offers some of the best country horseback riding. Several other churches in Bagbasi and Çamliyamaç are just off the road to Erzurum, passing by the Tortum Waterfalls and the pristine Tortum Lake. Other Georgian churches and settlements near Yusufeli are Dörtkilise, Köprügören, and Tekkale. Yusufeli itself boasts wonderful possibilities for nature lovers and hiking at 4000 meters. East of Artvin is the former Georgian capital Ardanuç, with its famous castle, which overlooks the longest canyon in the region. 55 km east of Artvin is Savsat, an alpine village surrounded by meadows of wild flowers and butterflies, rushing streams and quaint chalets. The local womens’ organisation has established a training center for weaving in an attempt to keep the indigenous carpet and kilim traditions alive. Karagöl – Sahara National Park, 17 km from Savsat on the way to Ardahan, has one of the most beautiful Karagöl alpine lakes as well as the widely-known Sahara plateau. The lake is 45 km northeast of Savsat via Veliköy Village, another typical authentic village. 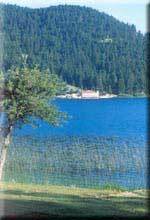 The area around the lake is covered with a variety of pine trees and also has picnic facilities. Wildlife, including bears, is plentiful. The Sahara plateau itself is also covered with beautiful mineral and fresh springs. On the plateau is Kocabey Kislagi Village where you can see traditional wooden houses with their friendly residents. Another important plateau and popular summer residence in the region is Bilbilan whose people are also exceptionally welcoming and helpful. Generally, in all the national parks you can see wonderful examples of birds and butterflies.